The fastest way to an American consumer's heart is through excess. In the United States, gas is cheap, the roads are big, and everyone wants others to know just how successful they are by driving big, luxury crossovers. BMW has enjoyed sales success with its SUV lineup, which includes the X1, X2, X3, X4, X5, and X6, but even though the new X5 does offer third-row accommodations, it only fits the European description of large. To truly build an SUV fit for the American definition of large, BMW had to go even bigger with the all-new X7. Although it may just look like an enlarged X5 on the surface, this X7 may be the most important BMW of this decade, being the first positioned squarely at the Cadillac Escalade, Mercedes-Benz GLS, and the mighty Range Rover. BMW actually builds the X7 in the US at its Spartanburg, South Carolina plant, making it a true German-American hybrid. The X7 looks a lot like an X5 that has eaten its way up a few pant sizes. This isn't necessarily a bad thing, as we think the current X5 and this new X7 both look pretty handsome. The X7's sheer size is enough to give it an imposing presence on the road. At 203.3 inches long, 78.7 inches wide, 71.1 inches tall, and with a wheelbase of 122.2 inches, this is by far the largest model BMW has ever built. Pair the X7's stature with standard 21-inch wheels (or optional 22-inchers), BMW Laser Headlights with blue accents on the V8 model, and plenty of M Performance flavor, and we think BMW has landed on a winning design. Although, we'd be remiss if we didn't mention the big grille in the room. People have criticized the X7's massive kidney grille, which is also found on the facelifted 7 Series. We think the grille matches the enormous size of the car in person and we doubt a smaller one would look any better. If anything, it is the area below the grille on the V8 model that looks overstyled in our eyes. There may be some complaints about the grille but it is nearly impossible to fault BMW on what sits under the hood. At launch, the X7 will be available with two engine options, both of which send power to all-wheel-drive through one of the best eight-speed automatic transmissions in the industry. The base xDrive40i model uses a 3.0-liter twin-scroll turbocharged inline-six producing 335 horsepower and 330 lb-ft of torque while achieving EPA fuel economy ratings of 20/25/22 mpg city/highway/combined. Stepping up to the xDrive50i bumps the engine up to a 4.4-liter twin-turbocharged V8 with a whopping 456 hp and 479 lb-ft of torque. The V8-powered X7 is a thirsty beast with fuel economy ratings of 15/21/17 mpg city/highway/combined. Regardless of which engine you choose, towing capacity is identical at up to 7,500 pounds with the optional towing package. The main reason you'd choose the V8 over the inline-six is for acceleration and noise. The X7 is no lightweight at 6,989 pounds with the inline-six and 7,253 pounds with the V8 but it can still rip off a 0-60 mph run in 5.8 and 5.2 seconds respectively. We can't believe such a large vehicle can get out of its own way with such ease, and our jaws dropped when BMW casually mentioned that both versions of the X7 include launch control. It's hard to imagine any parents triggering launch control to leave their kid's soccer game but you better believe we tried it out on our test drive. We found the extra oomph of the V8 to be impressive but not entirely necessary. The inline-six feels more than capable, though the exhaust note of the V8 sounds like belongs in an M car, especially when you hear it up close from back in the third row. If you've been in the latest X5, you'll feel right at home in the X7. All of the materials feel incredibly premium and it's apparent that BMW paid special attention to equipping the X7 with useful features. We are referring to things like heated and ventilated cup holders, five-zone automatic climate control, and optional pillows to stick on the second-row headrests. Seriously, these pillows are more comfortable than anything you have on your bed at home. There are also plenty of unique trim touches to help dress up the interior even further. The iDrive control, for example, can be replaced with glass controls made of Swarovski crystal. For just $650, this is easily our most recommended option on the X7. We also fell in love with the Panoramic Sky Lounge LED moonroof, which lights up along with the ambient lighting to create an even more inviting cabin. BMW's iDrive control unit remains one of the best in the business, though we had limited time to play with it on this drive. Since this was only our first drive of the X7 and we didn't get to spend a whole week with the car, it is nearly impossible to mention all of the various technology and safety features. We were happy to have the Extended Traffic Jam Assistant, which can essentially pilot itself at speeds of up to 37 mph. BMW has also made the Traffic Jam system triggerable through just one button press located on the steering wheel, making it incredibly easy to activate. The Lane Keep Assistant, on the other hand, felt entirely too overbearing and we ended up turning the system off. We also couldn't wait to turn off BMW's new voice control system, which can be triggered when you say the word 'BMW.' In our brief encounter with the system, it never activated when we wanted it to and it constantly engaged when we were just having a conversation, though BMW assures us the system is still being perfected. Ditto for the X7's gesture controls, which are easy to trigger if you frequently talk with your hands - and we talk with our hands a lot. As nice as the X7 is from the comfort of the massaging front seats, the back seat is really the ideal place to sit. Here passengers are treated to two, albeit optional, touchscreens mounted on the back of the front seats, which allow rear seat occupants to adjust the radio, set destinations, and even play various forms of multimedia. Those forms of multimedia will sound excellent as well because the optional Bowers & Wilkins Diamond Surround Sound system offers an insane 1,500 watts powering 20 speakers, though it does cost a hefty $3,400. X7 buyers have a choice between a bench seat or second-row captains chairs, the latter of which includes a handy storage area with two cupholders and USB-C ports. If you have more than four or five people to haul around, getting into the third row is made easy with completely electronic adjustment for the second row. Once you become acquainted with the X7's power seat controls, getting into the third row is a breeze where a generous 33.3 inches of legroom awaits. Unlike the X5, which felt cramped in the third row, the X7 feels like it can legitimately be used to haul six adults in perfect comfort, though having seven might be a squeeze. As we first saw on the X5, the X7's split-folding tailgate is now completely automatic and can be opened or closed with a single button press. From the rear cargo area, the second and third rows can be folded electronically either individually, or all together using max passenger or max cargo switches. With the second and third rows folded, the X7 offers a handy 90.4 cubic feet of storage space. If you're using the third row, that space shrinks to 48.6 cubic feet. Only a handful of full-size SUVs pack a truly usable third row and the X7's main rival, the Range Rover, doesn't offer one at all. Much to our surprise, the X7 doesn't drive like just a larger X5. In fact, it feels miles apart from its mid-size little brother. The X7 feels much larger from behind the wheel without feeling cumbersome to the driver. Thanks to BMW's pair of stellar engine choices, the X7 shrinks as soon as you mash the pedal. The steering has a nice weight to it, making the experience pleasurable on the highway without feeling soulless when the road gets twisty. Fiddling with the drive modes drastically changes the X7's demeanor, shifting from a docile kitten in Eco Pro mode to a feral cat in Sport mode. As we mentioned, both mills do a stellar job moving the X7 around, though the V8's tantalizing exhaust note will make you feel as though you are piloting a vehicle that could embarrass most 10-year old M cars in a drag race. Even with the optional 22-inch wheels, the standard Dynamic Damper Control system with two-axle air suspension does a fantastic job modulating the ride over rough pavement. There is an optional off-road mode, which will easily conquer 99% of the muddy challenges an X7 owner will ever attempt. We only had very minor complaints with tire noise over extremely torn up pavement and while the engine stop-start system is not the best we've sampled it will likely be improved with the addition of a plug-in hybrid model. What truly shocks us about the X7 is how well it handles for a massive three-row SUV. There is an expected amount of lean when you throw over 7,000 pounds of metal through a corner but body roll was notably absent. When we asked the X7 to scoot through a series of backroads, it answered with dignified body control that many smaller, more nimble SUVs would struggle to muster. Price & Trims: Great V8, But Is It Worth It? The X7 is by no means a value alternative to a Chevy Tahoe or Ford Expedition but compared to the Range Rover, it's actually quite the bargain. The base xDrive40i starts at $73,900 and includes standard three-row seating, air suspension, four-zone automatic climate control, a panoramic roof, Black SensaTec seats, and a slew of safety features. These include Active Driving Assistant with Blind Spot Detection, Lane Departure Warning, Rear Collision Warning, Frontal Collision Warning, and Pedestrian Warning with City Collision Mitigation. If you're thinking about the V8 xDrive50i, you'd better be pretty darn sure about wanting the extra power because it bumps the price all the way to $92,600. You do get more for your money than just the V8 including a Vernasca leather interior, Harman Kardon Surround Sound, Parking Assistant Plus with a 360-degree camera, head-up display, and Active Driving Assistant Professional with the Active Lane Keeping Assistant and Extended Traffic Jam Assistant. Add the Driving Assistance Professional Package for $1,700, which includes Active Cruise Control with Stop & Go, Active Lane Keeping Assistant with Side Collision Avoidance, and Automatic Lane Change. The Luxury Seating Package for $1,600 adds the massaging seats with ventilation and the Parking Assistance Package for $700 adds the 360-degree camera. BMW also offers some ala carte options, so we'd recommend the second-row captain's chairs for $600, the Panoramic Sky Lounge LED Roof for $750, glass controls for $650, and the Harman Kardon surround sound system for $875. As suggested, the total price is a semi-reasonable $82,415. All of the complaints we had with the X5 - besides the overly sensitive driver's aids - have been addressed with the X7. The third-row seat is now usable for adults, the ride comfort is sublime, and most importantly, BMW finally has a weapon to compete against established full-size American SUVs like the Escalade and Navigator and Japenese rivals like the QX80 and Lexus LX 570. The X7 even has a massive trump card against the reigning champion of the segment - the Range Rover - with its surprisingly usable third-row seat. With this new X7, BMW has cracked the code on building the perfect American luxury SUV. 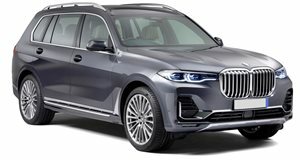 We believe this may be the new benchmark for the large luxury SUV segment, which is why the 2019 BMW X7 earns a rating of Must Buy.